The Cumberland & Dumfriesshire Farmers’ Mart P.L.C. had forward 7,297 ewes, gimmers and ewe lambs at the Annual Special Sale at Longtown on Tuesday 14th September 2010. The largest company of buyers ever seen at this centre, from Thurso and Aberdeen in the north to Devon in the south, trade for all classes was excellent. An increased entry of Greyface (Mule) ewe lambs were a credit to their vendors. Quality and strength was much better with an overall average of £87.78, which was up £18.41 on the year. The show prior to the sale was in the capable hands of Bill Skelton, Rook Farm, Tallentire, Cockermouth, whose task wasn’t easy. 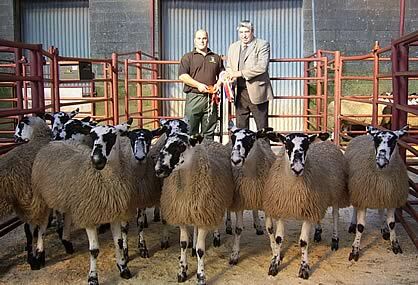 His champions came from Messrs James, Midtodhills, Roadhead, Carlisle and sold at £160 to Mr Elliott, Bank House, Mungrisedale. 1st prize – Messrs Carruthers, Peela Hill, Bewcastle, sold at £122 to Tom Faulder, Houghton House, Carlisle. 2nd prize – R.M. & C.M. Leach, Whintingstown, Roadhead, sold at £100 to Mr Jack, Thurso. 3rd prize – G.M. & C. Walton, Allensgreen, Bardon Mill, sold at £115 to Tom Faulder. 2nd prize – Philip Roddam, Fordlands, Hethersgill, sold at £120 to Messrs Ridsdale, Yewtree Farm. 3rd prize – Messrs Wallace, Gapshield, Gilsland sold at £134 to the judge. Top flock averages were Parsonshield - £106.77 for 26 head, Peela Hill - £96.50 for 106 head, Midtodhills - £92.64 for 196, Fordlands £91.47 for 123, Snowden Close - £89.86 for 460 head. Other Greyfaces sold to £120 Bailey Mill and Fordlands, £118 Hole of Lyne, £116 Snowden Close, £115 Allensgreen; Bleu d’Maine £116, £114 Ormiston Lodge; Cheviot Mule £96 East Middle, £90 Lee Farm; Texel £90 Chapelcroft and Raggetsyke, £89 Crumhaugh Hill, £84 Flex; Suffolk cross £82 Shoestanes, £80 Nook; Half Bred £79 Gill; Charollais £78 Barkbeth. Shearlings met an animated demand and were short of requirements. Top of £146 and £145 for Greyfaces from Hayclose, £138 Porterstown, £132 Baron House; Cheviot Mule £142 Springwell; Texel £140 Duke Street, £138 Kinning Hall, £135 Dinwoodie Green; Rouge £135 Dinwoodie Greeen; Charollais £100 Allerley Crescent; Suffolk £108 Allerley Crescent. Ewes were again a strong trade with best quality best to sell. Top of £134 for two shear Greyfaces from The Flatt, who also sold three shears at £112 and four shears at £97. Texel £99 Trough Head; Half Breds to £92 Broomhillbank; Suffolk cross £90 Barkbeth; Cheviot Mule £85 Milsington; Lleyn £64 Bavernochan.